I have always loved getting used books because there inevitably is something left in them from the previous owner. Whether it was a shopping list or just notes and marks in the book itself, i always felt like somehow that artifact was a remnant of the history of the book itself. I wanted to replicate this idea, finding something sacred in a book. 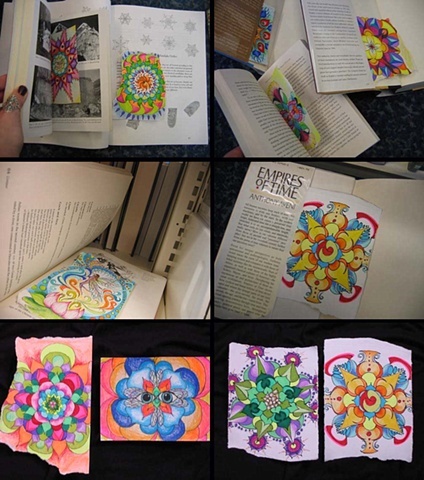 I drew 25 mini mandalas, all different, all intricately detailed and I left them in library books throughout the various floors and sections of the Cleveland Public Library. The mandalas were anonymous, which was a very important part of the project, since i didn't want it to be an act of advertising in any way. I wanted an individual to find these little treasures completely randomly as they opened a book, wonder if they should keep it or not, or let it pass on to the next "owner" of the manuscript. I left them in varied topics from engineering manuals to religious treatises, to urban planning documentation to environmental pamphlets, trying to sample as much of the library going population as possible. Since they were anonymous and since this is the first time I am actually publisizing that I did this at all, i really don't know what happened to them. I did return and try and find a few of them and one or two still remained in the dusty volume i left them in years before, waiting for their owner to locate them. I felt that I gave them life in a way, and that they were out in the world by themselves to do and find what they may.